The journey home always seems shorter but the journey from Cork on Saturday passed particularly quickly for the Skerries players and supporters as they brought with them four points to improve their table position to seventh. On a windless but crisp sunny afternoon, performing on the artificial Musgrave pitch, Skerries withstood the early pressure from a strong, physical home side by a determined commitment to compete with little regard for their own safety. The return from injury of their Captain, Mikey Sherlock, with mid-field partner Sean Dempsey performed marvellous work in midfield. This return allowed Kevin McGrath and Paul Devitt resume their natural positions on the wing and Lorcan Jones occupy the full-back position where his pace and courage impressed. Scrum-half Eoghan Carron, whose reactions demand complete concentration and support from his back-line, particularly when Skerries are awarded penalties, controlled the game with authority giving out-half Billy Mulcahy opportunity to constantly probe and ask questions of the Sundays Well defence. Second rows Tom Mulvany and Ross Halligan excelled in the lineout, and were physical in the contact area while the backrow of Michael Turvey, Ben Jenkinson and the outstanding Ross McAuley controlled the breakdown situations and provided a ferocious defence, in particular, a try-saving tackle executed by Jenkinson being the highlight. Within minutes of the start Skerries went 3-nil down after conceding a penalty but in the space of the following fifteen minutes Sundays Well were forced to concede five penalties punished by a conversion by Paul Devitt, and subsequently further punished by a yellow card being shown to a second-row player. During this ‘Bin’ time Sundays Well kept their line intact and shortly after his reintroduction back into play second row Josh Barnes finished off an excellent period of play by Sundays Well to score an unconverted try to give the hosts an 8 – 3 lead. .
A Skerries attack brought play to the opposition goal-line where Sundays Well offended and Carron, unexpectedly, tapped a quick penalty. 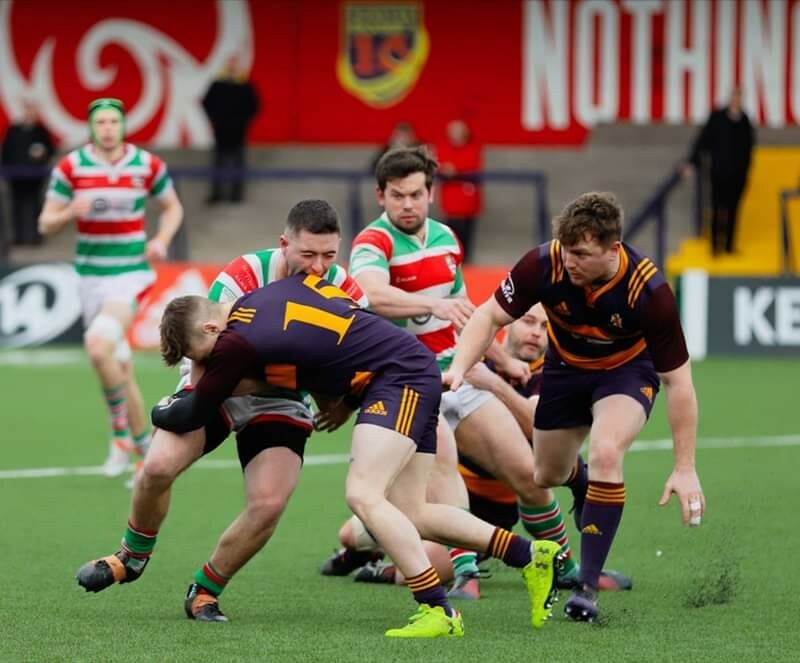 Taking everybody by surprise as it was from a very kickable position and it was lucky that Halligan was paying attention and offered support which resulted in Skerries scoring their first try heading into half-time, score 8 – 10 to the Goats. On resumption of the second half, Devitt and Dempsey demonstrated some delicate skills in the Skerries backline which gave Sherlock the opportunity and space to score a touchline try. This was superbly converted by Devitt. Skerries were now playing a swift but controlled game and for the next quarter and Sundays Well were forced to concede a concession of penalties. With play flowing end to end, it was the home side that benefited from a converted penalty. Score now 11 – 17. A controversial yellow card for McAuley then followed for a supposedly interference of a player in the air. A harsh and somewhat controversy decision which did not please the Skerrries faithful but didn’t negatively affect the drive and commitment from the team. The last 15 mins of the match tensions and passions were flying high with Skerries pressure and defence phenomenal but unfortunately resulted in another yellow card for Skerries, Turvey punished for a high tackle. McAuley back on for the last phases of play of the match and his presence had an immediate impact. In the final minutes of the match, Sundays Well mounted on the pressure, were awarded a 10 metre lineout. The Skerries pack defended with huge intensity ending in McAuley forcing the turnover and game over! They survived the onslaught and so well deserved. All credit to Sundays Well, it was a game that kept the crowd on edge right to the final whistle. Skerries now face Belfast Harleguins next Saturday at home, KO in Holmpatrick at 2:30pm.